After a very long time I am posting a recipe today. I know I’ve become very lazy and couldn’t find time to post a recipe. Finally I am back to SpicyTasty and of course I missed posting recipes. 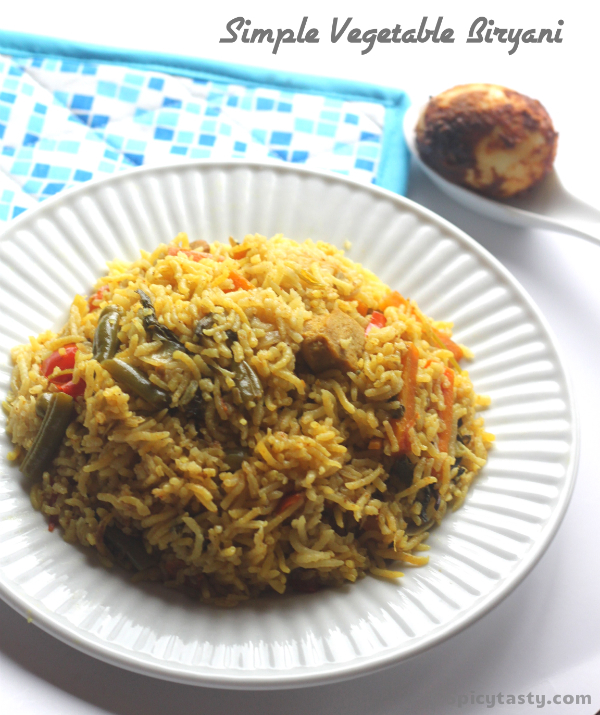 My sister made this vegetable biryani when she visited us from India and we all loved it. It’s very simple and easy. 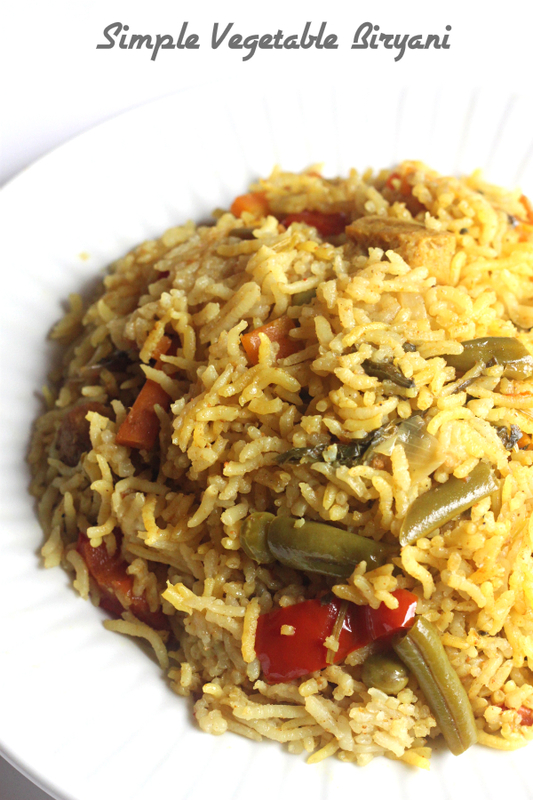 If you are a big biryani lover then try this simple recipe you will love it. Wash and soak the Basmati rice for at least 30 minutes. After that drain the rice and just fry them with a tbsp of ghee and keep it aside. Grind mint and coriander leaves and keep them aside. Heat oil in a pan add fennel seeds, cardamom, cloves and cinnamon. Fry them for a minute after that add onions fry them till it becomes translucent. Now add ginger & Garlic paste and green chilies fry them for a minute. Add tomatoes and all masalas (turmeric, red chili, coriander, biryani masala and garam masala) fry them for couple of minutes. Now add all the vegetables with salt and mint, coriander paste. Mix it all together then add coconut milk and water. Let’s just come to boil and after that transfer that into electric rice cooker with rice. Mix it well and sprinkle some coriander leaves on top. If you are using an electric cooker as soon as the light turns to warm or the the rice is cooked, transfer the contents to a hot pack or a serving tray to avoid burning rice at the bottom. If you are using a pressure cooker, cook the rice for one whistle and then remove from heat. One who makes biryani is not lazy! 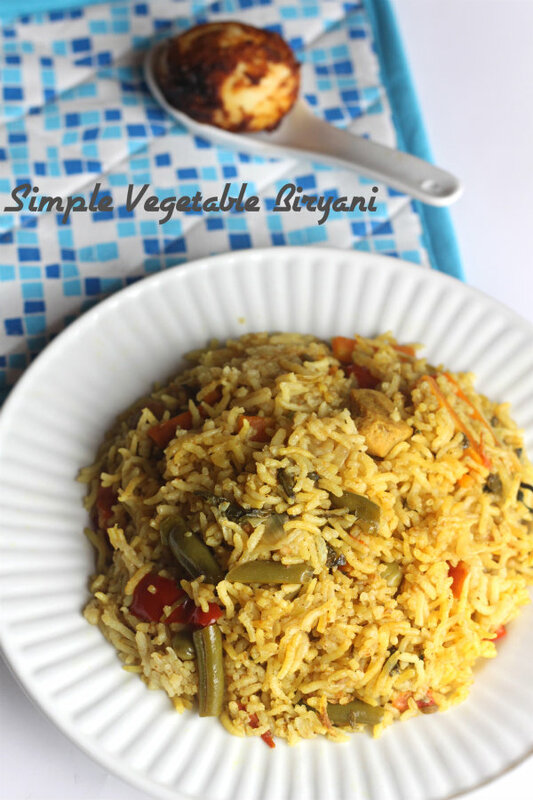 Loved the vibrancy of the pictures of the veg biriyani. Looks so inviting and tasty. Excellent preparation.